As mentioned previously, the PCI Express bus is software compatible with PCI 2.2 compliant devices. As Intel stated, all current operating systems will support PCI 2.2 compatible interface cards in PCI Express systems using the existing PCI drivers. This is because the legacy bus is still present, just in a reduced form. This was an essential requirement if PCI Express technology was to gain widespread acceptance. Forced obsolescence does not tend to go over well with computer users. The current standard PCI Express implementation, as seen in chipsets from Intel, nVidia and VIA, allows for 20 lanes of PCI Express in total. 16 of these are used for the PCIe x16 graphics slot and four more are distributed between any combination of PCIe x1, x2 or x4 slots. Current PCI Express capable chipsets include Intel's 915, 925 and upcoming 955, nVidia's Nforce 4 and nForce 4 SLI Intel Edition and VIA's K8T890, among others. Both AMD and Intel processors are now well-supported with PCI Express, though Intel chips had the technology well before AMD chips realized it with the introduction of the nForce 4. Other than video cards, there are few PCI Express-based peripherals on the market, but with nVidia and ATI's products spearheading a huge adoption of PCI Express capable motherboards, it should not be long until peripherals based on the technology are currently available. It was predicted that Gigabit Ethernet adaptors would be the first technology to be commonly available using PCI Express besides video cards, but since most PCI Express capable motherboards now integrate Gigabit adaptors, there is little demand for them in the desktop market. A PCI Express 1X connector is ideal for gigabit Ethernet cards, which have enough throughput to potentially cripple a standard PCI 2.2 bus. As found in most modern PCI Express motherboards, the Gigabit Ethernet controller is soldered directly to the motherboard and runs through the PCIe bus. 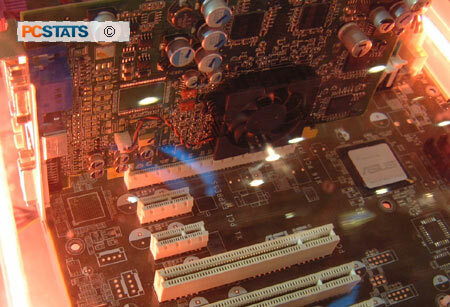 The BTX form factor (announced at IDF 2003) is intended as the replacement for the current ATX motherboard standard, and included in its specifications are an X16 slot instead of an AGP connector for graphics, and two 1X PCI Express connectors in place of several of the PCI slots. In the picture to the left, the PCI Express slots are coloured blue. The BTX formfactor is beyond the scope of this article, so for more information about it, look here.